It is the experience of many canners that tomatoes are unusually “sloppy” in seasons of excessive rainfall. They find this is evident both from the amount of water that separates on the peeling table on in the can during or after processing. 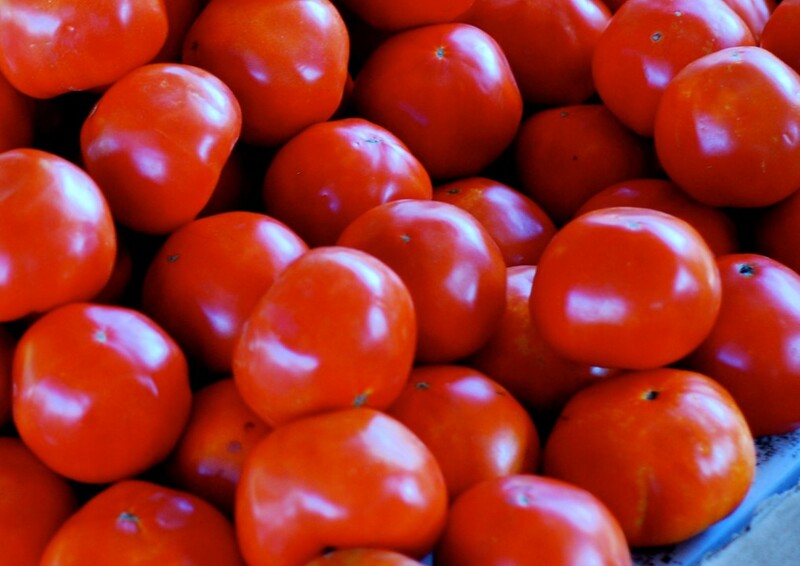 The composition of tomatoes varies through rather wide limits because of the environment in which they are grown. Arrangements were made with the Bureau of Plant Industry and the Maryland Experiment Station by which the laboratory secured samples of tomatoes of known varieties grown on plants set aside by these institutions for that purpose. During the growing seasons of 1914 and 1915 tomatoes were picked as fast as they ripened (usually two or three times a week). In both the years mentioned the rainfall was higher before the tomato season than during the season, and the ground was well saturated at the time the tomatoes began to ripen. There was considerable variation in the composition of successive pickings, which could not be explained by variation in rainfall. There appears to be a general tendency for the soluble solids to decrease in amounts as the season advances. Tomatoes ripening in September and October may contain less solids than those ripening in August because of the cooler weather. We are not warranted, therefore, in concluding that the high rainfall and the relatively high soluble solids in the first part of the season are evidence of a relation between the two. The question would have been simplified if we had, as we hoped to have, a heavy, soaking rain preceded and followed by dry weather. However, it appears improbable that the “watery” condition of tomatoes observed after a heavy rain is due to a greater percentage of water in the tomatoes. I don’t know. Where I pick my tomatoes, I’ve picked in drought and picked in very wet conditions. When there’s been a lot of rain and standing water, the tomatoes begin splitting very quickly, and the fruit is nearly tasteless. In dry conditions, they hold their form, and are tasty as can be. In fact, the growers told me one of my first years to pass by any split tomatoes, because they would be water-logged and not at all satisfactory. My suspicion would be that the length of the rainy/wet period is key. As the writers suggest, heavy rain followed by hot and dry is much better. But all of this is nothing more than opinion! I’ve had similar experiences – and my opinion is similar to yours. I think that close to harvest that hot and dry weather is best. It’s interesting to think about how the micro-climate can affect the quality of fruit and vegetables. We eat any tomato that comes into our house. As you might guess, we have never successfully grown our own. Like you, we don’t have very good growing conditions for tomatoes. Each year we get some tomatoes, but not a huge number. That is interesting! Our tomatoes split too if the get too much water. It’s so annoying when tomatoes split. We’ve also had similar problems with cherries splitting when they get too much water. I never thought about all this interesting stuff before! I like how you get all your scientific information from 100 years ago ;). I haven’t had a homegrown tomato in about 10 years, a fact which is now making me sad. I enjoy reading the findings of research studies both then and now. I find it fascinating how they’ve changed across the years. It is so interesting! What is particularly notable, to my mind, is how often what was truly “spot on” or very wise is what has been lost. I’ll have to pay attention to this next year. Like you, I’ve noticed that tomatoes tend to split after a lot of rain, but I’ve never really paid attention to what the weather was like prior to that. My first vegetable garden was absolutely abundant. It was behind our garage in a space that used to house two 70 foot pine trees, and lots of brush and poison ivy. My husband had the trees taken down and my father-in-law brought in a small bulldozer to clear out the brush. Every time I weeded it, I would get a few poison ivy bumps. This lasted a couple of years until I started a new job that had a summer program component that stole all my time. The garden turned to weeds. But I do remember that contrary to what I’d read, which was better to water less but more drench it, I watered every day, but less, and that seemed to work. Not sure what the ideal conditions are, but it’s interesting to read that person’s opinion. It’s really interesting that the tomatoes did better when they were more consistently watered -but with less water each time.